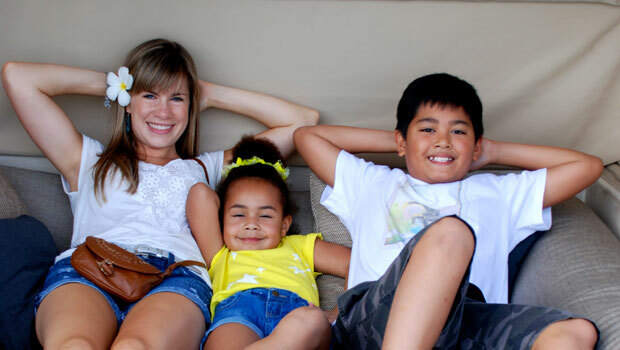 Liz G. from the United States, is an au pair in Australia. Talk to your host family about limiting television viewing before bedtime; television can overstimulate children. End the evening with quiet activities. If children go to bed at 9 p.m., put on some quiet music and plan calm activities around 8 p.m. Get baths done early. If you help the children to quiet down before bedtime, it will be an easier transition. Read a story to younger children to help them get ready for sleep. Be firm. Children love to say “Just one more!” and will try to get one last story, or drink of water, or last trip downstairs. Don’t let them prolong bedtime. Be consistent. If you let children stay up until 10 p.m. one night, they’re going to fight to stay up until 10 p.m. every night. Don’t use bedtime as a punishment. This will make children think that bedtime is a bad thing, when this part of the day can really be a pleasant and relaxing experience for everyone. Children get sick often, so you are likely to care for a sick child more than once during your year with your host family. After you get to know the children you care for, you will be able to tell when they are not feeling well - even before they know they’re sick. Talk to your host parents about how they care for sick children and what special things they do to help sick children feel better. Parents are responsible for dispensing children’s medication. Do not give children aspirin. It can cause Reye’s syndrome, a serious illness. Keep a sick child quiet, but they don’t have to spend the day in bed unless the doctor says so. They can lie on the sofa in the family room, or play quietly. Provide the sick child with quiet things to do: reading, puzzles, coloring books, television, or listening to calm music. Encourage the child to drink lots of fluids. If they are having stomach problems, the doctor may tell you to give them only clear fluids. Fluids are especially important if the child is feverish, vomiting, or has diarrhea. Nurture them! Sick children tend to regress, or to act younger than they actually are. Keep them company. Create a Sick Day box, just like a Rainy Day Art box. This can include a few special toys and games that the children only see on sick days. Young children might especially enjoy a special sick day puppet friend. If the family owns a humidifier, put it in the sick child’s room - it will help him to breathe better. Use the cool mist setting, as it is safer than warm mist. See the section on First Aid for treatment of specific illnesses. 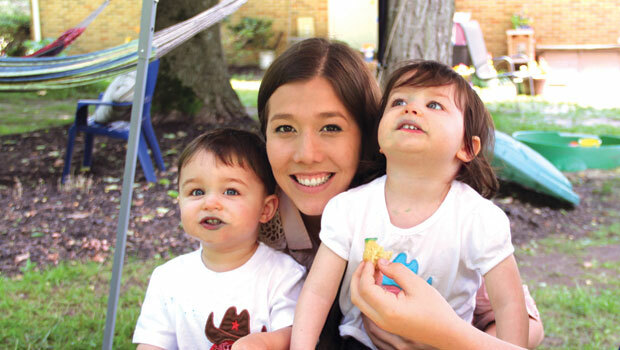 Patricia S. from Mexico, is an au pair in New Jersey, USA. Talk to your host family about the children’s diet, and acceptable eating behavior. Many children are picky eaters who don’t like to try new foods or who refuse to eat certain foods. Most children do not like extremely flavorful or spicy foods. Encourage children to try at least a bite of everything on their plate. Serving food on a very large plate will make the servings of food look smaller, and may encourage children to eat more. Children should sit when eating. This will reduce the risk of choking: Children who eat while walking or running may get food stuck in their throat. Snacks and candy are always a big deal with children. Every family has different rules about junk food, so ask your host parents what snacks are allowed. Too much junk food can make a child sick, and will interfere with eating nutritious meals. Don’t give children too much juice between meals; it has a lot of sugar too, and may spoil the appetite. Many children have allergies to certain foods. Read the information on allergies, and talk to your host parents about their children’s food allergies and how to avoid them. Some food allergies can be dangerous, so it is important that you pay attention to what the child eats. Certain foods are dangerous for young children to eat, because they may easily cause choking: grapes, hot dogs, popcorn, spoonfuls of peanut butter, and hard candy can get stuck in the throat. Make sure that all food you serve to young children is in very small pieces. The world can sometimes be a big, scary place to a child. Fears are a normal part of childhood. Very young children may be afraid of strange things - clowns, the basement, people with facial hair, or even certain plants! It is important that caretakers be sensitive to these fears. Don’t tell the children that they are being silly. Acknowledge that some things can be frightening and reassure them that they are safe, and that nothing is going to happen to them. Talk to them about the fear, and don’t punish children for expressing fear. You can desensitize children to fears by slowly and carefully exposing children to their fears. If a child is afraid of dogs, try reading stories about dogs, watching shows about dogs, then very slowly introducing the child to dogs in public, first at a distance, then eventually in person. Don’t force the child to face their fear before they are ready; that may make the fear worse. Young children may be frightened by things they see on television. Monitor what children watch on TV, and talk to your host family about what is and is not acceptable television viewing - every family has its own guidelines. Pets are an important part of many children’s lives: dogs, cats, rabbits, birds, fish, and many other animals that you might never think to have as a pet. Most children love their pets very much, but all still need help learning how to interact with animals. Don’t allow children to tease pets or to treat them roughly. Very young children need help learning how to handle an animal, and dogs and cats may snap at a young child who pulls tails or hits. If the children in your host family are responsible for taking care of an animal, make sure they do not postpone or avoid these jobs. Children should wash their hands after handling animals or their cages, especially before eating. Play has a critical role in the development of children because it enables children to explore their environment and the world around them, to make hypotheses (guesses) about how things work, and to test those hypotheses. Through play, children practice and experiment. As intelligent child care providers, we can maximize the benefits of play by providing the children in our care with a safe, stimulating place where they can interact with the world. Everything in the child’s environment is a potential stimulus for play. Put away any items the child should not touch or handle. Provide opportunities for both organized play (led by you) and unorganized play (where the child determines their own actions). Provide opportunities for non-competitive games, including puzzles and cooperative play. Competition can be very stressful for children. If possible in your host family’s home, and it is OK with your host parents, set up special areas in the house for different kinds of play: an art area with cutting, pasting, coloring, and painting materials; an area for fantasy play; a comfortable reading area with books. Understand what games are appropriate for the age of the child. Children younger than five or six do not understand rules. As children enter school, they are ready to learn games with simple directions and rules, such as tic-tac-toe. Talk to your host family about the house rules regarding video games. How long are children allowed to play each day? Does their homework need to be done first? If a child is too excited or frustrated by a video game, have them take a break and try another fun activity. Keep play safe by supervising carefully. Talk to your host parents about their rules for outside play. It is especially important that you closely watch active play. If children are playing on swings or other moving equipment, keep other children away so that they don’t get hit. Children using baseball bats or other sports equipment need to be careful of those around them. Most of the time, children will play well without adults getting involved or interrupting. Children should be able to play independently without frequent adult interference. When children need rules clarified. When children need limits enforced. When a situation is becoming potentially unsafe. When a child is out of control. When children have a conflict they can’t solve themselves. When children need help taking turns. Rainy days can be especially difficult for caretakers when children can’t go outside. Children get restless indoors and seem to bounce off the walls. Prepare for rainy days in advance so that you will have lots of things to do. Below is a list of ideas to get you started. Do some baking with the children: Let them help you measure and mix the ingredients. Plant some seeds in small pots to wait for the next sunny day. Make puppets with old socks, mittens, yarn, and cloth scraps, and plan a puppet show. Dress up in old clothes and put on a play. Take photographs of the children doing what they do every day: eating breakfast, playing with their toys, brushing their teeth. Then, on a rainy day, paste the photographs in a book and make “A Day in the Life of Michael.” Children absolutely love to tell stories about themselves, and will happily read their very own storybook again and again. Throw a sheet over a small table so that the children can play in the “fort” under the table. Play a board game. Keep special games and puzzles hidden away for special rainy days. Paint a picture of the best day you ever had. Make a card for mommy or daddy to give to them when they get home from work. Teach the children new card games. Teach the children songs and games from your home country. Make a photograph family tree showing the child’s relatives. With the children out of the room, hide a small toy and let them find it while you give them clues. Bathtub science: Collect items (that can be wet) from around the house and see what floats and sinks in the bathtub. Let children guess what will float and what will sink. Make boats to float in the bathtub. Note: All bathtub play must be carefully supervised. Play with clay or Play-Doh. Create a Rainy Day Art box in advance, containing all kinds of craft supplies: fabric, ribbon, buttons, egg cartons, cardboard, towel rolls, yarn, old magazines, popsicle sticks, straws, toothpicks. Save anything that could be used again. Children can turn any scrap into part of a fun art project. It is also useful to have a few inexpensive store-bought supplies, such as crayons, scissors, glue sticks, tape, markers, and watercolor or tempera paint. Children should not waste, spill, throw, or destroy materials. Children should not put materials in their mouths. Children should wear aprons or old adult T-shirts when working with messy materials to protect their clothing. Your local library will have many books of art projects and ideas, and will be a wonderful resource for you throughout your year as an au pair. Choose books that are appropriate for the child’s age and interests. Very young children will not sit still long enough for a very long story, and prefer books with many pictures. Find a regular quiet time to read every day. Let children help to select books to read. Use your hands and voice to dramatize a story. Keep the child involved in the story and ask them questions as you read: What do you think is going to happen? Why is something happening? Reading should be fun for children - don’t force them. If a child isn’t interested in reading, try to find books about the child’s own interests to motivate them. The librarian at the local library can recommend many good books for children of all ages. Many local libraries and bookstores also have “story hour,” where you can bring young children to listen to a storyteller.